Grand Canyon is a very sharp ravine created by the Colorado River in the Arizona, United States. This canyon is controlled and maintained by the Grand Canyon National Park, the Havasupai Tribe and the Hualapai Tribal Nation. It is a beautiful canyon and around 5 million tourists visit the park every year. It is about 446 km long, around 29 km wide and is over 6,000 feet deep. The Grand Canyon is regarded as one of the Naturally Occurring Seven Wonders of the World. This amazing wonder of the world was created after being eroded by the Colorado River for nearly 17 million years. Such great erosion has given birth to the Grand Canyon. The area around the Grand Canyon was and is still inhabited by Native Americans. They live in the caves around the canyon or build settlements around it. People belonging to the Pueblo Tribe believed that the Grand Canyon is a holy place and used to pay pilgrimages to it. Garcia Lopez de Cardenas was the first European who witnessed the beauty of the Grand Canyon in 1540. The Grand Canyon is not the deepest or the widest canyon in the world; but it is still acknowledged for its overpowering size, complex and exciting landscape. Strikingly colorful rocks are preserved in its walls. These rocks enhance the attractiveness of the Grand Canyon. These rocks are one reason why this canyon is so famous worldwide. History of the North American geology is also preserved in these rocks embedded in the walls of the Grand Canyon. President Theodore Roosevelt of the United States was one of the chief advocates of the preservation of the Grand Canyon. 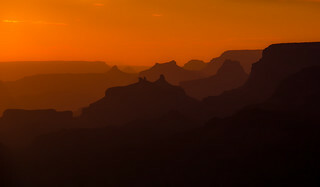 He visited it in 1903 and made efforts to protect the mighty canyon. Because of his attempts, the Grand Canyon is preserved until now and continues to enthrall us.